The Concordia Stingers football team entered their Sunday afternoon battle against the Université Laval Rouge et Or on a four-game winning streak, their best start to the season since 2006. Alas, the Stingers fell 32-16 to the 2013 national champions, a team that hasn’t lost a regular season game since 2012. Despite the loss, the Stingers’ defence held the dominant Rouge et Or squad to their lowest number of points scored in a single game so far this season. Defensive back Kris Robertson, however, is mindful to keep that accomplishment in perspective. “This isn’t a moral victory, losing is losing,” said Robertson, who recorded five tackles in the game. “We want to win. Nonetheless, Stingers head coach Mickey Donovan commended his defence on its performance. “[Assistant Coach] Pat Donovan has been doing a great job every week preparing the guys,” he said. “All we need to do now is just execute when we get the ball on offence—and we will—we will keep working and points will come,” he said. Points were hard to come by for the Stingers’ offence this past weekend as the team lost starting quarterback François Dessureault and 4th-year veteran slotback Jamal Henry to injuries in the first quarter. Backup QB Colin Sequeira held the fort in relief, completing 21 of his 38 pass attempts and throwing for 238 yards, a touchdown pass and an interception. The first-year pivot was also sacked five times. “After my first couple series, and getting some passes completed, […] the coach called plays that helped me settle into the game faster, and I got into that rhythm that allowed us to move the ball,” said Sequiera. Sequiera was already playing catch-up by the time he stepped onto the field late in the first quarter; as Laval opened the scoring with a one-yard touchdown run from QB Hugo Richard just under seven minutes into the game. Yet the Concordia defence managed to hold the Rouge et Or to only nine total points after the opening 15 minutes of the game, with an interception by defensive back Michael Asare and other key defensive plays stalling Laval drives. The Stingers showed glimpses of hope on the offensive side of the ball as they marched into Laval territory repeatedly. Unfortunately, numerous second-down sacks by the Laval defence kept the Stingers from finishing off drives, forcing them to punt. A second Richard run gave Laval a 16-0 lead heading into halftime. The Stingers’ defence remained as stingy in the second half as it was in the first, forcing three consecutive two-and outs in the third quarter. 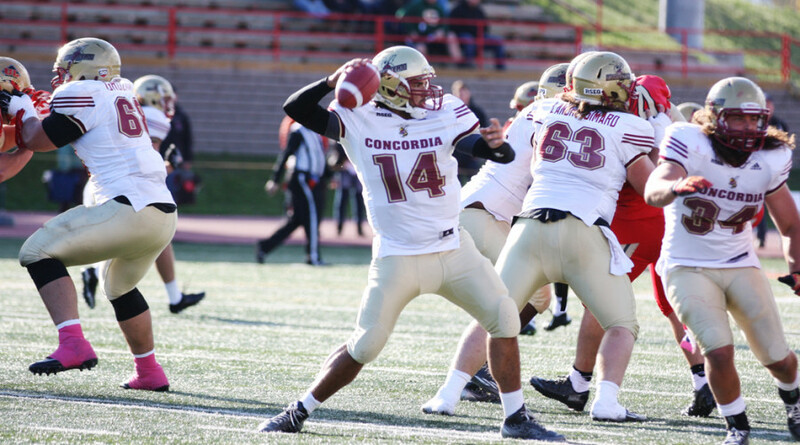 In the second half, three consecutive two-and-outs forced by the Stingers’ defence kept Concordia in the game. 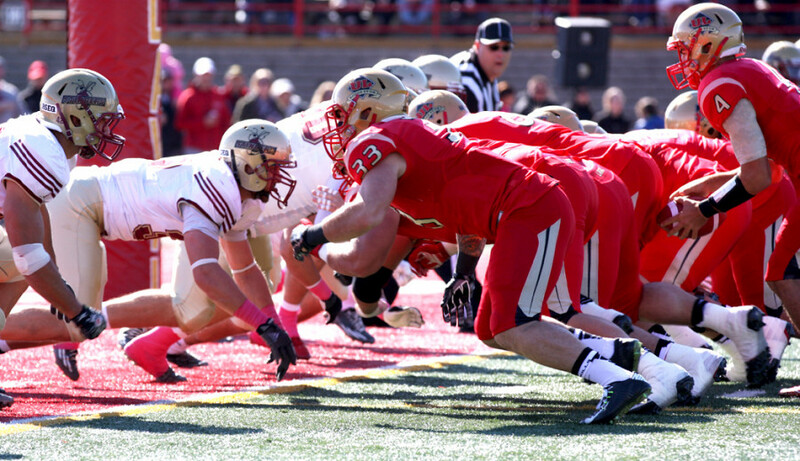 However the offensive struggles continued, as the team made its way into Laval territory. Even the long receptions from slotbacks Alexandre Hebert and Shayne Stinson, were not enough to find the end zone. Eventually, the Stingers’ struggles to find offence led to more points for Laval, with an interception by Sequiera resulting in another Rouge et Or touchdown, increasing their lead to 23-0. The Stingers were able to reduce the deficit late in the fourth quarter with a rushing touchdown from Sequeira and a touchdown reception by Daniel Skube, but it was too little, too late for Concordia. The schedule doesn’t get any easier for the Stingers, who are now 4-1. Concordia’s next game is against the Université de Montréal Carabins, who are also 4-1, this coming Saturday afternoon at home. “We know what we’re made of and we know we can do this, we will be ready for Montreal,” Robertson said.